masks has a special inner lining. It is made of a material that is an athletic fiber, designed to be worn against the skin. This fiber is also designed to wick away moisture from the skin. Mask comfort is largely determined by what’s happening “next-to-skin”. In warm weather, if moisture is allowed to remain you feel a bothersome clamminess. In cooler temperatures this same moisture becomes chilling – robbing you of precious body heat. Breathe Healthy’s mask technology’s “temperature regulating” mastery over moisture accumulation comes from its hydrophobic (moisture-hating) polyester and hydrophilic (moisture-loving) nylon. This combination creates a 2-Zone Comfort Lining® resulting in a push-pull effect that deploys perspiration away from skin. 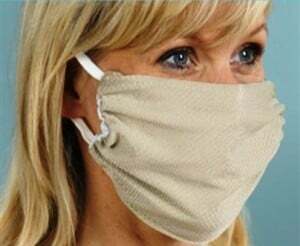 The lining material Breathe Healthy® uses in all of our masks is patented and features a unique three layer knit construction. When combined with a second layer, they provide effective filtration for allergens, dust, a variety of bacteria, mold spores, and dander, and help protect against airborne effluents resulting from sneezes and coughs. The AEGIS shield is a unique chemical technology that can be applied to a material, making it anti-microbial active. The AEGIS Microbe Shield technology permanently bonds (polymerizes) with the substrate and will not leach or diminish overtime. The technology relies on the coating remaining affixed to the substrate – killing microorganisms as they contact the treated surface. The AEGIS Microbe Shield is a permanent antimicrobial that, when applied properly only by trained applicators, becomes part of a new surface – a surface that is highly resistant to microbial attack. Unlike all other conventional antimicrobials, AEGIS does not off gas, leach, diffuse, migrate, volatilise, or otherwise leave the surface to which it has been applied. The result is an extraordinary safety and efficacy profile unmatched by other products. The incorporation of AEGIS Antimicrobial, and its remarkable surface modifying characteristics, has produced a new generation of air filtration products that can provide effective control of airborne microbes while eliminating the filter surface as a potential site for bacteria growth. How does the Aegis Antimicrobial technology work? The AEGIS Microbe Shield is a reactive silane quaternary ammonium compound. When applied as a liquid to a host filter material the active ingredient in the AEGIS Antimicrobial forms a colorless, odorless, positively charge polymer coating which chemically bonds, virtually irremovable, to the treated surface. You could think of it as a layer of electrically charged swords. When a microorganism come in contact with the treated surface, the sword punctures the cell membrane and the electrical charge shocks the cell. Since nothing is transferred to the now dead cell, the Antimicrobial doesn’t lose strength the sword is ready for the next cell to contact it. What are the differences between the AEGIS Microbe shield technology and other Antimicrobials on the market? Conventional Antimicrobial products penetrate livings cells and kill by way of poisoning the organism. This poisoning technology is applied to a host media where it slowly leaches out creating a “killing field or zone” around the surface into which targeted microorganisms pass. They are designed to act quickly and dissipate quickly in order to avoid adverse effects to humans and animals due to their toxic ingredients. The AEGIS Antimicrobial takes a totally unique approach. It provides an effective initial microbial kill when applied, like the conventional methods, but it also provides long-term control of growth on treated surfaces for the life of that surface. The surface itself is modified to make it anti-microbially active. Is the AEGIS Microbe Shield Toxic? No. It does not volatilize, dissipate, or leach onto other surfaces or into the environment. The AEGIS Microbe shield is non-biodegradable. Its chemistry polymerizes where it is applied and forms a permanent bond that lasts for the life of the treated surface. These resources are useful places to research causes, symptoms and treatments for asthma and other breathing problems.